What a hot week! Temperatures were high in the nineties and the muggidity was stifling for a big part of the week. On the hottest day, a team of lawn guys, wearing black hooded sweatshirts, were working hard grading our backyard for a much-needed new lawn. Ugh! I chose to live in New England to escape the “Hazy, Hot, and Humid” summers of my childhood in Maryland. Due to climate change, these many years later, more frequent, longer stretches of the Maryland summers have caught up with me in Boston. The difference, I don’t live in a house with central A/C now. Frozen desserts like ice cream and popsicles are an antidote to the hot weather. It was fortuitous that the recipe chosen for Cook the Book Fridays, an Extra Edition on this fifth Friday in August, was ice cream! The actual recipe was for Apricot Kernel Ice Cream. I didn’t have any apricot kernels to use. Instead, I remembered that Italian amaretti cookies, the ones that come in the red tin with pairs delightfully wrapped in paper, are made NOT with almonds but with apricot kernels. Without apricot kernels, I went the opposite way and simply made Almond Ice Cream by adding almond extract instead. I realize the flavor isn’t the same. The almond flavor was smooth where it would have had a bitter note with the kernels. However, I was in the mood for ice cream and didn’t have readily available apricots. Without needing to steep the kernels makes the recipe simper. 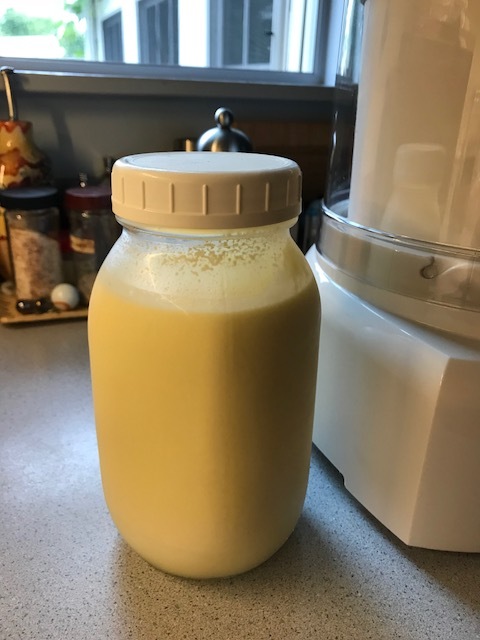 I added the sugar to the milk and cream which I warmed to dissolve the sugar. I immediately proceeded with the recipe by whisking the warm milk into egg yolks and heating to for a custard. I might have overcooked it slightly as it seemed to curdle at the end but pressing it through the strainer smoothed it out. I added a teaspoon of almond extract to the final mixture of custard and cream. After chilling the custard for most of the day, twenty minutes in the ice cream maker froze the custard for a smooth ice cream. I let it sit in the freezer for a few hours to firm up further. Almond ice cream was a refreshing topper for the last slice of the peach tart I made this week. Note that when I was searching for a picture of the amaretti tin, I found this article in the New York Times archives that indicates I could have substituted peach, nectarine, or plum kernels for the apricot. That never occurred to me. Apparently, the inner kernel of all these stone fruits share the bitter almond flavor of the apricot. I wish I’d known that. I could have tried out the real thing. Next time. You can find the recipe for Apricot Kernel Ice Cream on page 312 of David Lebovitz’s My Paris Kitchen. Reviews of the ice cream recipe by other members of Cook the Book Fridays can be found here. If you want to make a delicious peach tart before summer ends, here’s my latest favorite dessert concoction. First, prepare the sweet tart dough. Press into a 9- or 9½-inch tart pan with a removable bottom. Freeze for at least 30 minutes. Line with foil and bake at 375F for 25 minutes. Remove the foil and bake another 3-5 minutes until lightly golden. Let cool. To make the topping: Whisk together sugar, flour, almond flour and salt. Use your hands to work butter into the dry ingredients until it’s crumbly. Spread the peach jam on the bottom of the crust. Top with peach slices, arranged in concentric circles. Sprinkle with the topping. Bake for 45 minutes until fruit is bubbly. 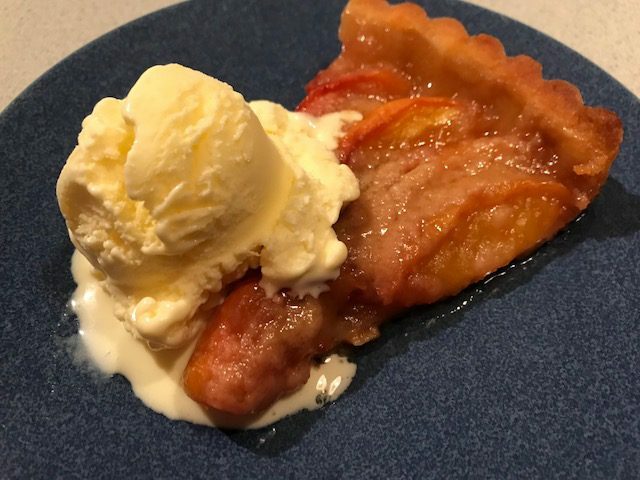 Posted on 31 August 2018, in Baking, Cook The Book Fridays, my paris kitchen and tagged Cook The Book Fridays, ice cream, my paris kitchen, peaches. Bookmark the permalink. 4 Comments. I have some lovely Okanagan peaches right now. I was trying to decide between a crisp and a pie, but now you’re making me think I might have to go with tart! The photo with the tart and ice cream looks so inviting for a summer day. As for the kernels, now that I purchased a bag for myself, I had better start looking for other recipes that use them. Too bad Tricia isn’t going back and forth to Boston, I would send some up to you. This is fascinating re; the amaretti cookies using apricot kernels! I’m not a big fan of almond flavouring but it’s good to know for next time I need apricot kernels and I’ve just missed the season! This ice cream was pleasant – but like Nana, I need to find a good way to use up the rest of that bag!